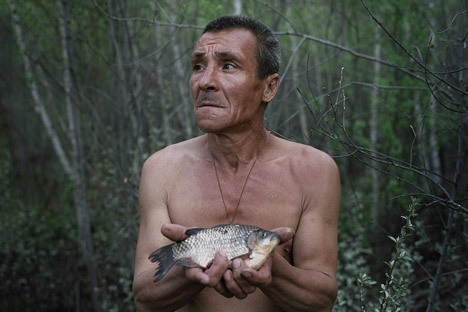 Tkachenko's series “Escape,” about hermits, took first place in the “Staged Portraits” category. Danila Tkachenko takes pleasure and pride in exploring the hidden corners of his native country. Twenty-five-year-old photographer Danila Tkachenko has traveled the world, but still feels most at home in Russia. “Abroad, everything is organized and comfortable. But there’s no enigma, it doesn’t ask questions like Russia does,” Tkachenko said. It was an attempt to solve one of these Russian mysteries that led Tkachenko on the journey that brought him victory in the 2014 World Press Photo competition. His series “Escape,”about hermits, took first place in the “Staged Portraits” category. For three years Tkachenko carried out social fieldwork, seeking out hermits’ habitats and living with them, recording their stories and photographing them. For Tkachenko, an important part of the project was about self-identification: “I'm trying to define myself outside of any cultural-historical context or framework imposed by society and stereotypes,” he said. Before beginning his study of hermits, Tkachenko took a trip to Altai, where he spent a month alone living in the mountains. It was a difficult experience for the Moscow native, who said that his month in Altai was the first time he had encountered such isolation. “When you spend a long time away from society, you begin to forget certain social mores. You see things from another perspective and behave differently. In a community, it’s hard to know who you are. You succumb to the influence of society, and how you act is perhaps not what you feel,” Tkachenko said. Tkachenko has not always been a photographer. He worked as a bartender and made some attempts to set up his own business before picking up a camera five years ago. Intrigued by photography, he enrolled at college to study photojournalism and got a job with a newspaper. But journalism was not for him: “I ​​didn’t want to work to order. You turn into an image-producing robot, and the editor uses your work to manipulate public consciousness,” he said. Tkachenko had the opportunity to explore more of his own ideas about photography and art at the Rodchenko Moscow School of Photography and Multimedia. After completing his studies, Tkachenko left his newspaper job to devote his time and energy to his own projects. The hermits Tkachenko photographed were all different: some spent their days erecting totems and inventing new religions; some were vowed to silence and expressed their thoughts only on paper; others dug ponds. One was growing a new kind of ginseng and asked Tkachenko to bring him a bottle of good wine and cigars. But, in the words of the photographer himself, there’s one characteristic that united them: naturalness. “I noticed that if they were in a bad mood, they’d behave in accordance with this mood without hiding it,” Tkachenko said. A book with his photographs of hermits was published by Germany’s Peperoni Books and presented at the Vienna Photo Book Festival in June. “Danila’s pictures are not simply a photo report about poor and isolated people in Russia,” said Hannes Wanderer, the founder of Peperoni Books. Tkachenko’s next project, “Restricted Area,” explores technological progress and its effects on society. The photographs in this collection are of abandoned facilities that once heralded Russia’s great scientific future. The buildings include an unfinished cosmodrome, a mine and an antenna developed for communication with Mars. In his work, Tkachenko suggests that technological progress is being encouraged by governments as a way of manipulating people to produce things they do not really need. Tkachenko favors internal development and creativity over the latest high-tech device. His feelings about technology are reflected in his own work process – maybe that’s why he takes most of the pictures with a film camera and uses his digital Pentax 645D only on certain occasions.